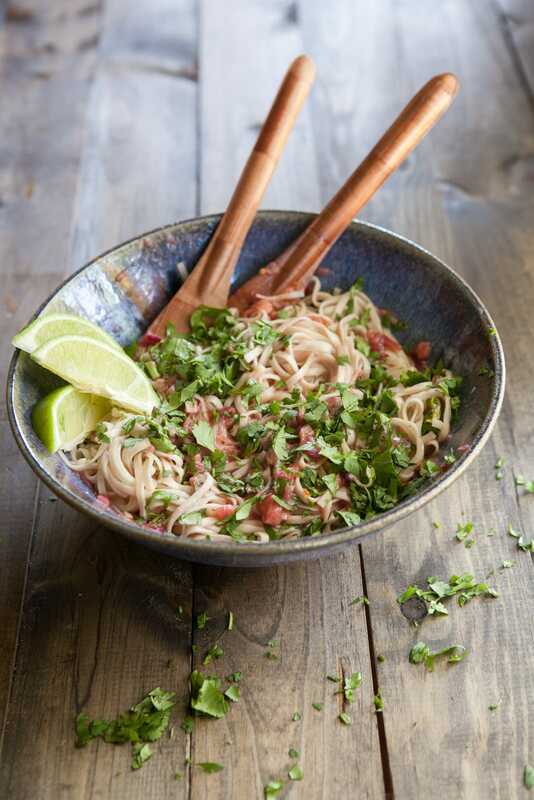 Noodles with Kale and Spicy Rhubarb Sauce | Naturally. My family doesn’t really celebrate holidays (when everyone lives in the same town, we see each other more often than not.) So instead, I spent time with friends eating my way through egg casseroles and cinnamon rolls, playing ridiculous games that made me cry because I was laughing so hard, and sitting outside in the gorgeous spring air. I’ve been so wrapped up in everything else that is going on in my life that I’ve forgotten to step back, take a breathe, and enjoy. I’m notorious for going and going until I make myself sick. My parents noticed this at an early age when I would try and sleep over at a friend’s house for two nights in a row (we never stopped playing- it was awesome.) Sure enough, every third day, I’d get sick. This happened in college too when I was cramming for finals and finishing the semester. Usually I’d be sick by the time the final actually happened. I could give you at least two dozen examples but it all comes down to: I forget to stop. As part of my yesterday, I began dreaming of ways I could make this week’s food matters project dish a little more appealing. Yet, I forged on to the list of ingredients and I realized there was actually a delicious rhubarb sauce hiding in the pages. Ever since I made Chipotle Rhubarb Salsa, I’ve been craving savory rhubarb again. I have to warn you though, this meal isn’t for the rhubarb hater or the “I only eat rhubarb when it’s covered in 2 cups of sugar” person. The rhubarb adds a tartness to the dish that hits you first, then you get sweet from the honey, and finally, a bit of spiciness in the back of your mouth. I love this dish. I feel poor rhubarb gets a bad rap because on it’s own, it’s tough and tart but when paired correctly and not covered in gobs of sugar and cinnamon, it’s quite lovely. This week’s recipe was chosen by Camilia and you can find the original recipe there. For everyone else’s take, pop over to the Food Matters Project site! Shred kale and place in a large bowl. 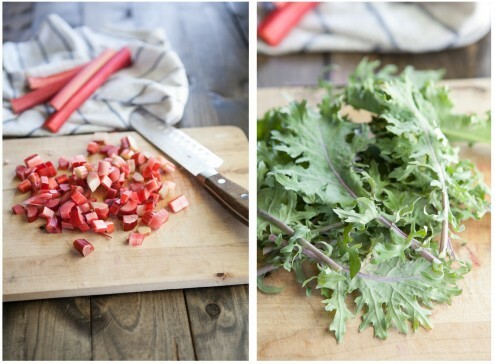 Once noodles and rhubarb are done, toss with kale to slightly wilt. Top with cilantro and lime wedges to serve. I had the same thoughts about those fish nuggets but was intrigued by the rhubarb sauce. I intend to make something with it this week, since I was out of town this weekend. This dish sounds great! This is super unique!! I love rhubarb, but haven’t tried it in a savory dish. Sounds awesome! I am thrilled that you actually had rhubarb for this week’s dish! You were one of the few. I laughed about your ‘nugget’-aversion. I feel the same way, I suppose, but I didn’t articulate it that was. I just said to cut the fish into chunks and left it at that. Ironically, I found some rhubarb the morning after I adapted the recipe, so I’ll give this recipe a whirl. Thanks for the inspiration, Erin. This looks fabulous. I’m really glad you picked this recipe even if it seems like very few could find rhubarb or thought the dish was a fail! I hope it at least gets people out of the rhubarb=sweet notion! This looks awesome! I’m disappointed I couldn’t find fresh rhubarb but I did find frozen, finally! I intend to make rhubarb sauce for crepes, hoping it works as well as planned so I can post it later today. Aye aye aye, I’m such a bad cofounder! Ha ha- I got really lucky that my small grocery store actually had rhubarb. My next thought was to sneak into my grandpa’s back yard and nab his baby rhubarb. Can’t wait to see your crepe version! This looks delicious! Lucky you found some rhubarb… Here, it was nowhere to be found. What a beautiful meal you made out of this recipe! I was grossed out by the word nugget too! Haha. By the way, did your blog get a makeover? It looks great!!! This looks fantastic! On the dinner list this week. I would KILL for some rhubarb around these parts. Here and there you might see hot house rhubarb around this time, but it just isn’t the same. Can’t wait to try a savory dish like this once it starts popping up in the fields though. I am also conditioned to think that any sort of food nugget is inherently evil. Just not awesome sounding. Haha, fish nuggets does sound gross. I do enjoy fish though so I’m sure there is a much better name that those could be called, lol. Your version looks fantastic though. I only really discovered rhubarb last year and can’t wait to try some more savory versions of it this year even though I do love it in more sweet(but still sour!) dishes. I love what you did with the rhubarb. I love your mantra! I think I might need to start chanting it as well…I’m definitely prone to taking on too much and then trying to just power through. I love the changes you made to the sauce…I think your version might actually be edible! And seriously “nuggets” are code for gross to me also. Your take on this recipe sounds and looks like something I’d love. 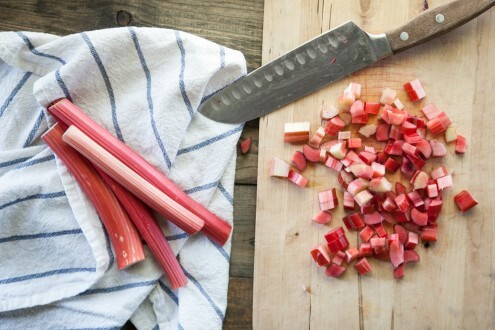 I’ve bookmarked it for when I come across fresh rhubarb, because I really want to give the savoury rhubarb sauce a try. What a unique recipe! My husband loves rhubarb. Actually, I’d never even had it until I met him. Really cool recipe. 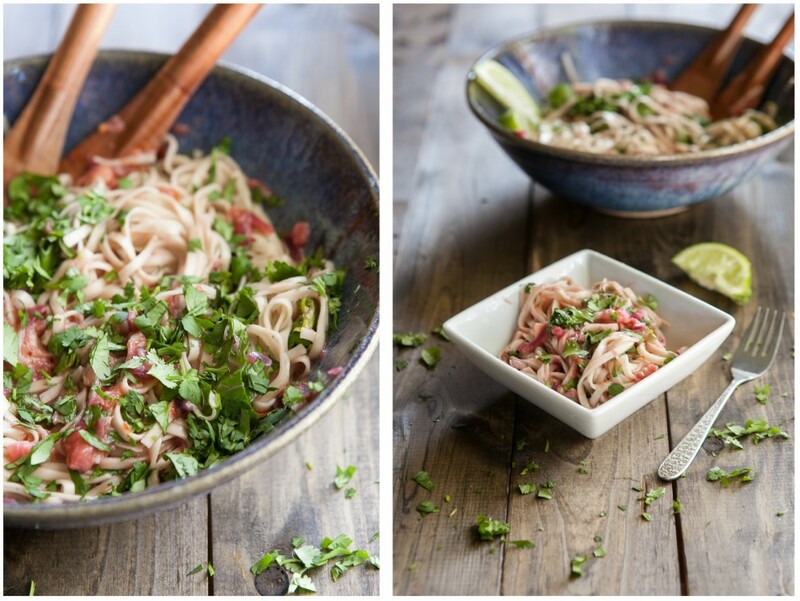 I think rhubarb is kind of like cilantro- people either love or hate it. Glad your husband loves it! I’m notorious for going until I break too. Man. And this recipe looks great. I love rhubarb anything! Thank you for doing something with rhubarb other than adding it to strawberries! I love the twist! Yum! I love rhubarb in savory dishes! Finally got my hands on some rhubarb–seriously delicious! I was looking through my Google Reader today for ideas to use up the rest of my rhubarb, and I came across your recipe again…I had never tried rhubarb in a savory dish before, but I decided to give it a try and now I’m so glad that I did! I just made it for dinner and I loved it! The sauce was the perfect combination of sour, sweet and spicy and it made such a simple yet flavorful dish with the pasta and kale. Thanks for the recipe! What would you suggest as an alternative for rhubarb in the recipe when it isn’t in season? That’s a good question and I’m not sure I have a really good solution for that! Let me think about it and get back to you! Made this last night – so yummy! Got rhubarb in our food share this week; hoped to use it in a savory dish; tried this; it is horrible. Sorry you didn’t like it!